#365DaysofLondonBaby – Day 6 – London’s Cable Car | That's London Baby! “Emirates Air Line towers 24 May 2012” by Nick Cooper at English Wikipedia. Good morning! An ordinary Thursday, and you might have just gotten out of a crowded Bus or Tube and be moaning about TfL and the London Transport. 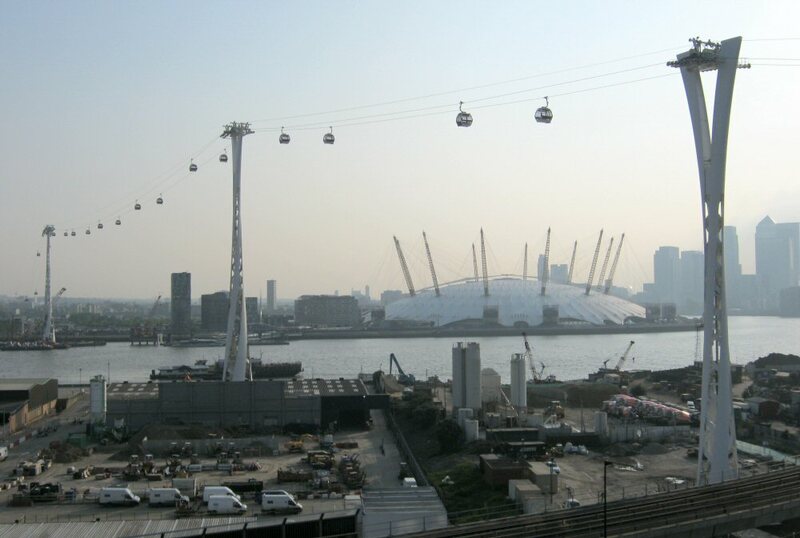 While overcrowded public transport is not the best of London’s features, one TfL line is usually empty and provides a great travel experience – The “Emirates Air Line”, London’s Cable Car. It opened on 28th June 2012, just in time for the Olympics, and is an official line opened by TfL from Royal Victoria Dock (DLR Station Royal Victoria) to the Greenwich Peninsula (Tube Station North Greenwich or by boat). The journey takes you up to 90 metres (300 ft) over the Thames and takes about 10 minutes (five minutes in “Commuter Rush Mode” from 7-9am; 12-13 minutes in the “Evening Sightseeing” mode after 19.00 in the evening). At this hight, you have a great look over the O2 Arena, London Docklands, London City Airport, Canary Wharf and the skyline of the City of London on the horizon. The night picture is one I took at a crossing a few months back. Next to an “ordinary crossing”, if you want to make it a “true experience” – or if you are an aviation geek , you can visit the “Emirates Aviation Experience” right next to the North Greenwich Station. It costs £3 for Adults and £1.50 for Children (Discount Prices available in connection with a return ticket for the Cable Car). There are even real Boeing 777 and A380 flight simulators (to be booked separately for £45 for up to 4 persons for 30 min). All practical information on opening times, fares, accessibility etc. can be found at TfL’s Website. Oyster/ Travel Card Holders get a discount on the fares, contactless is not yet accepted but if you go to the ticket window with the contactless card, you’ll still get a ticket for the Oyster Card Price.